This is an easy recipe but is fun to make and eat, and uses ingredients you probably have on hand. Boneless, skinless chicken breasts are excellent, but you can use chicken thighs if you'd like, or even pork tenderloin, sliced and pounded thin. If you use chicken thighs, the cooking time would be increased to 5 to 8 minutes total. The pork should cook to 150 F in about 2 to 4 minutes. Make sure that all of the meat is pounded to the same thickness so it cooks at the same time. And always check the final internal temperature with a meat thermometer. Chicken should be cooked to 160 F every single time. This recipe is cooked on a dual contact grill. If you use a regular grill and have to turn the meat, the cooking time is doubled. For sides, try garlic smashed potatoes or walloped potatoes. Add a green salad or a fruit salad and some scones or dinner rolls. 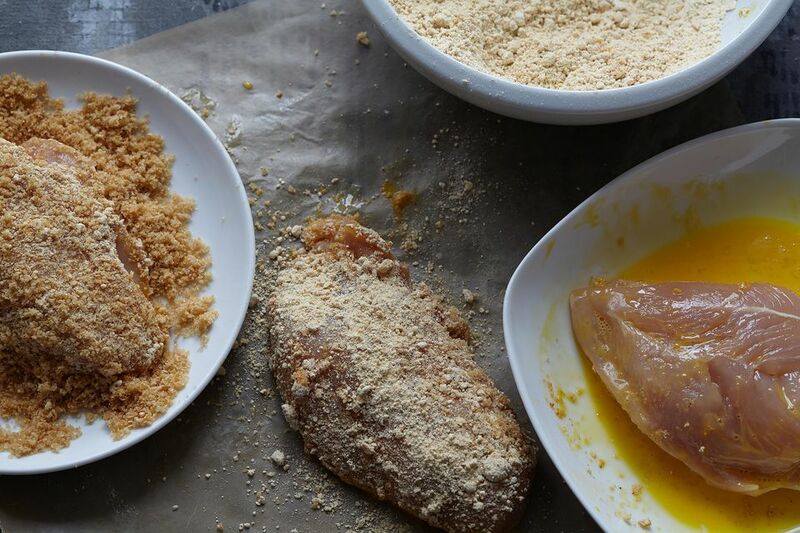 Place the boneless, skinless chicken breasts between two sheets of waxed paper and gently pound the chicken to 1/3" thick using the smooth side of a meat mallet or a rolling pin. Be careful not to tear the chicken. Pour the beaten egg into a shallow bowl. In a shallow pan, combine the cornmeal, basil, oregano, pepper, salt, and cheese. Brush the chicken with the lime juice, then dip in the beaten egg and then coat with the cornmeal mixture. Let the chicken sit on a wire rack for 20 to 30 minutes so the coating dries. Spray a George Foreman two-sided grill or ​another dual-contact grill with nonstick cooking spray. Cook chicken for 4 to 7 minutes until thoroughly cooked to 160 F, and the coating is brown and crisp. Serve immediately.